There are a few ‘challenger banks’ that have emerged in the last few years as part of the growing fintech movement. They are characterised by their different approach to traditional British banks in their operations and customer service, disrupting the market in numerous ways. At the moment they are not transparent about their investments, which raises questions surrounding their accountability. Among them Monzo, Revolut and Metro Bank are the most famous ones. Monzo is a digital, mobile-only bank based in the UK. Since 2017 Monzo’s banking restrictions were lifted, allow it to offer current accounts. Monzo has expressed its desire to remain a branch-less and cashless bank as well as operating without cheque books. Monzo also offers fee-free international money transfers and has positioned itself as making budgeting and financial management more accessible to all. Monzo is protected by the Financial Services Compensation Scheme, ensuring that any deposit of up to £85,000 is safe. Monzo is also a Living Wage employer, both for direct employees and subcontractors. In terms of Investment Ethics, Monzo claims to lend out a proportion of money stored in Monzo current accounts (up to 25% of total deposits) in the form of unsecured personal overdrafts and loans. The money that is stored in interest-earning Savings Pots is held in an account at another bank, Investec. We’ll keep you in the loop on any future savings partnerships. The rest sits in cash and balances at central banks. Monzo states that in the future they are likely to do more personal lending and invest some of the money in high quality liquid assets like UK government bonds. Monzo offers a free current account which you can easily switch to through their Current Account Switch Service. Their banking services are entirely online and operate through a mobile phone app, which can track contactless payments in real time. Due to its young age and structure Monzo has not been involved in any investment or corporate finance activities. Monzo has struggled with losses in the past, after its banking license was granted. Revolut is a branch-less bank operating in the UK since 2015. It advertises itself as a true global bank, offering free international money transfers, fee-free global spending, always at the interbank exchange rate. Founded 4 years ago, it already has more than 3 million customers worldwide. Recently, Revolut was granted a banking license by the European Central Bank, which will foster their expansion across the continent and guarantees that any funds deposited will be protected up to €100,000 under the European Deposit Insurance Scheme (EDIS). With their recently secured specialised bank license through the European Central Bank, Revolut will be able to accept deposits and offer consumer credits. The main difference between a specialised and a full-range bank is that the former is not authorised to provide investment services. As such, Revolut does not have public policies on investments. The latter two offer additional services such as overseas medical insurance, access to cryptocurrencies, and priority customer support. Revolut does not offer special student accounts. Like Monzo, Revolut has not been involved in any corporate finance activities as of yet. Metro Bank was the first high street bank to open in the UK in 100 years, founded in 2010. It is an American founded ‘challenger bank’, which focuses on very modern banking with updated technology and store availabilities compared to the traditional UK banks. Metro Bank have few official policies on their investments, but seem to mostly lend through personal and business mortgages and loans. This is likely due to their relatively small market stopping them participating in large corporate financing projects. Metro Bank is included in the UK Government run Current Account Switch service, with a guarantee of completion within 7 working days. Metro Bank clients’ funds are protected by the FSCS so any deposit up to £85,000 is safe. Metro Bank do not offer a specific Student Current Account at the moment, but do have Current Accounts and ISAs available for other uses outside of overdrafts. Every store is open 7 days a week, and from 8am–8pm on weekdays – they quote a maximum waiting time of 15 minutes to open an account. UK, EU, EEA and Swiss national can now open bank accounts online using biometric recognition services, however those outside of these nationalities will need to visit a local branch. More details can be found here. 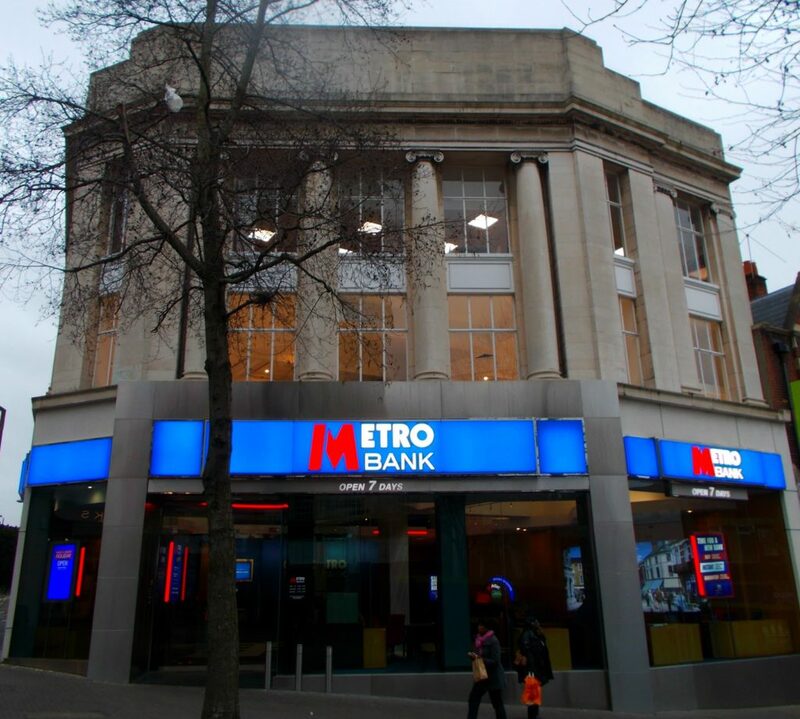 Ethical Consumer note that there have been ‘less flattering’ reports about Metro Bank’s customer service towards fraud victims – it is currently being investigated for refusing to cover customers who have had their savings stolen. Their share price recently plummeted by 30%, following the misclassification of commercial real estate loans and lower-than-expected profit margins. This may lead to another public sale of shares.